Konrad and Kristine, a married couple, had lived and farmed together for years. Over time, Konrad had grown more cross. This gave her a grand idea. After he checked on their baby boy, Konrad walked into the kitchen and studied the cupboards and icebox. There was no butter, so he pulled out the churn and set to work churning the cream. He was not accustomed to the hard work of churning, and he soon became terribly thirsty. He went to the cellar to tap a barrel of ale. Suddenly he heard strange footsteps over his head. He raced upstairs to catch the intruder. Sure enough, there was their pig, scuttling toward the churn. “Stop!” he cried, but it was too late. The creature toppled the churn and began to grunt with pleasure as cream poured out. Konrad had absentmindedly taken the tap out of the barrel, but he was so furious at the pig and so busy chasing it out of the kitchen that he forgot all about the ale. By the time he caught the pig and ran it out of the house, he remembered the ale. Konrad ran back down to the cellar, but it was too late. The ale had spilled across the cellar floor and was all gone. “Never mind,” he grumbled as he went back upstairs to check on the baby. He then went out to the dairy to fetch some cream. After he had churned for a while, he remembered that he had not fed the cow. She was locked up in the barn and hadn’t had a drop to drink or a bite to eat since yesterday. It was nearly noon, and the sun was high overhead. Konrad didn’t fancy the idea of walking the cow a mile down to the meadow, so he came up with a great idea. The cottage roof was made of thatch. The cow could have a meal up on the roof! The house sat close to a hill, so Konrad grabbed a plank from the barn and laid it from the ground to the lowest end of the roof — a perfect passageway up to the roof. Just as he was about to fetch the cow, he heard his son begin to cry. He raced inside to the baby’s room and lifted him from the cradle. He’d have to feed the baby, but first he had to feed the cow. So he carried the wee one out to the barn. As he was walking, he thought he’d better give the cow some water before he led her up to the roof. So he turned to the well and reached down to draw up a bucket of water. But as he bent over, the baby fell from his arms. Luckily, Konrad did not drop his son down the well. 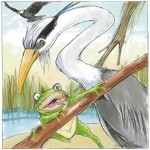 No, he dropped him on his head on the grass, and the baby began to wail at the top of his lungs. 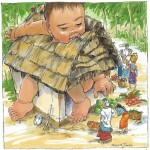 “Never mind,” Konrad said, and he lifted up the baby, drew a bucket, and carried both to the barn. The cow drank her fair share of water. He looked up at the sky. Soon it would be late afternoon, and he hadn’t begun to think about supper. 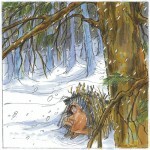 He needed to boil water for porridge. Back inside their home, he placed the baby on the floor and filled a pot with water. He built a fire and hung the pot over the fire. Suddenly, he worried the cow might fall off the roof. “I’ll tie her up there,” he said. So he climbed up the roof and tied one end of a rope to the cow’s neck and slipped the other end of the rope down the chimney. Konrad hurried back inside, so his son wouldn’t burn himself on the boiling water. He lifted the baby in one arm, tied the rope around his waist to sturdy the cow and, with his free arm, he began to grind the corn. Still, there would be no butter. But never mind, Konrad thought. The baby was fine. The cow would be fed. 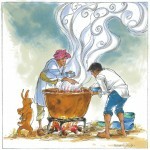 The porridge would be ready for supper. That’s when he felt a tug as the cow fell off the roof. As she fell, the rope jerked Konrad and his son up the chimney, where they got stuck. Kristine, meantime, had been cutting the grass all day. As the sun set, she waited to hear the supper bell. When at last it was nearly dark and no bell had rung, she walked home. On the way past the barn, she saw no pig and no cow, so she ran to the house. 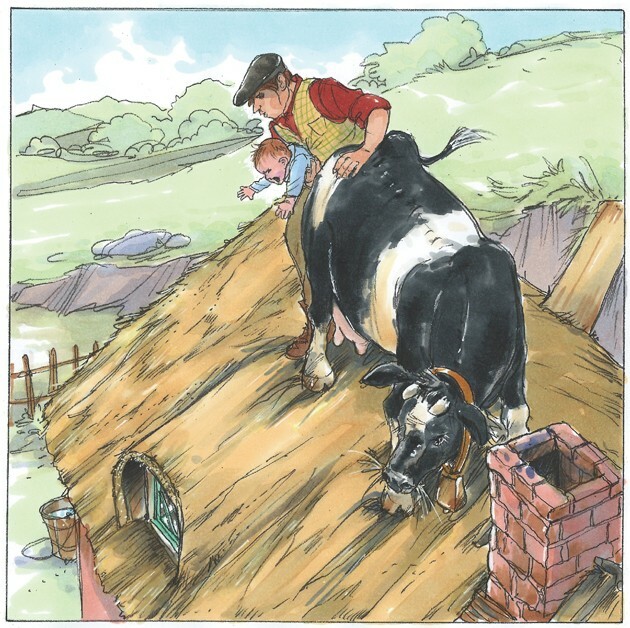 When she saw the cow hanging from the roof, she rushed inside and found Konrad and the baby up the chimney, the water boiled away, the oats not ground, the ale gone and cream spilled all over the floor. “It must have been a hard day, dear,” she said. From that day on, Konrad chose to work the fields and whenever he came home, he praised Kristine and all her hard work.